The last moments of one of the entries in last summer’s Cardboard Kayak Race, in which participants had to construct a kayak from cardboard and tape and then paddle it a short distance. This one turned out to be a folding kayak! A contribution to Ailsa’s photo challenge, Laughter. This entry was posted in Kayaking, Photography and tagged Cardboard Kayak, Kayak Race, Laughter, Photography, postaweek, postaweek2015, Travel, Weekly Photo Challenge. Bookmark the permalink. 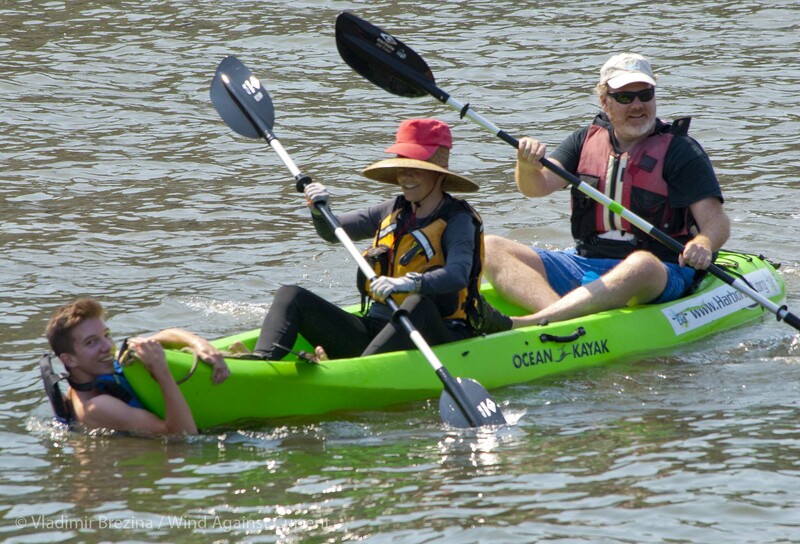 The 2015 City of Water Day & the Cardboard Kayak Race will be on July 18th. Register in April with your group to participate in the fun. Thanks for posting this information, Louis. We’ll be there if we possibly can! Sounds like such great fun! It did not hurt that the temperature on July 12, 2014 was 85deg and the water was great. We estimated about 1,000 on lookers. But this was only our second year. Each year it multiplies like rabbits. I will take the op to tell you all that if you register with one of the Boathouses and paddle/row with them to Governors Island you can camp overnight on the Island. BUT you MUST register. ..and a good time was had by all! He looks like he was having such a good time. Love it! OMG! This must been really fun for both of you! :-D Good one!! 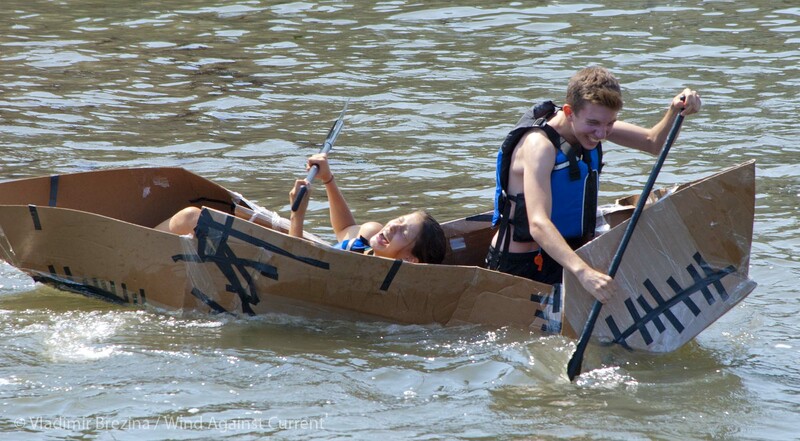 That wasn’t us in the folding cardboard kayak! (I’d like to think we would have done a better job ;-) ) I was taking photos from shore, and Johna was in one of the green rescue kayaks (as seen in the photo in the comments above). Aha. I am forewarned and forearmed. And would probably still lose, I suspect! P.S. – I missed the post last summer and just now saw it – fabulous, just fabulous! So glad you liked both posts—thanks!! This has to be a wonderfully fun event to watch and participate in. Love it and brings a smile to my face. Absolutely fantastic photo! Love it all. Go for it. Would love to see it! What fun! Such a happy young couple. Reminds me of Kate & William.